Whether you have a two bedroom or three bedroom house, you can convert it into a smart home starting at Rs 60,000 to Rs 70,000. Imagine that you are going out on a long vacation with your family and there's no one to water the plants in your absence. In such a situation, most people leave their plants in the care of their friends or relatives. Now imagine a device that will measure the soil humidity and water the plants automatically when needed. It is one of the features that smart homes are offering today, starting at a price of Rs 60,000 to Rs 70,000. On the higher side, the budget can go up to Rs 500,000 to Rs 600,000. With global technology giants entering the smart home space, the price of converting your house into a smart home has been coming down and implementation is getting easier. Recently, Amazon launched a range of its personal assistant Echo, starting at Rs 3,999 and going up to Rs 14,999. Google has started retailing Google Home starting at Rs 4,499. Companies that offer smart home solutions say that after these two devices hit the market, there has been a sudden spurt in queries. Many individuals are increasingly asking for a budget for installing smart home devices in their homes that Amazon Echo or Google Home can control. "Voice assistants are the most convenient user interface for smart homes, and the more convenient the user interface, the greater will be the mass adoption," says Shishir Gupta, co-founder, Oakter. A smart home lets an individual control three aspects of his house remotely. The smart devices are connected to the Internet through the home Wi-Fi, and they relay information to an app on the smartphone. Avinash Gautam, CEO, Silvan Innovation Labs, explains that the first is entrance management. When someone comes to your house and rings the bell, you get an alert on your mobile. The bell module is a smart device with a camera that lets you interact with the visitor via video. Similarly, if the door is unlocked, you are intimated about it on your smartphone. Then there is the surveillance and security feature. An individual can access the camera inside and outside the house on his smartphone to keep a tab on activities. 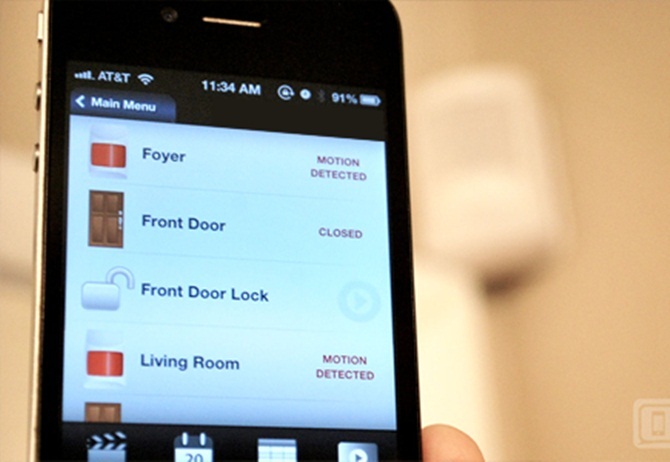 There are also options to install motion sensors that can alert you if someone is prowling around your home. 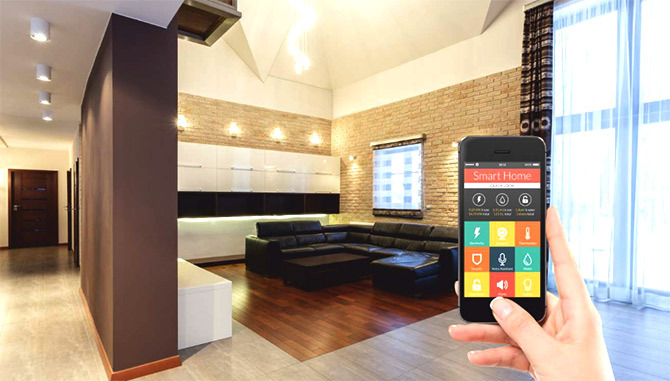 Next comes controlling electrical equipment inside the house using your smartphone. At the basic level, you can switch equipment on and off through an app. But these days, it goes much beyond. Once you install equipment such as Internet-enabled switches, plugs, thermostat, lighting, and so on, you need to integrate them with personal assistants like Google Home or Amazon Echo. "You can then talk to the virtual assistant to dim the light or switch them on and off. You can tell it to maintain the room temperature at a certain level, change the colour of the light depending on your mood or the time of the day, schedule time for water heating, and much more," says Gautam. Whether you have a two bedroom or three bedroom house, you can convert it into a smart home starting at Rs 60,000 to Rs 70,000. It will include entrance management solution, a camera, and allow you to control some of your electrical equipment. If you want complete automation in every room, the cost can shoot up to Rs 500,000 to Rs 600,000. For this budget, you will also get an expensive biometric lock, motored curtains, and so on. Costs rise as the number of rooms and the number of appliances/equipment you want to control remotely increases. If an individual owns a bungalow with a basement, ground floor and first floor, for example, the cost will shoot up. Gupta suggests that for villas with large areas, it's best to go for wired smart homes instead of wireless. It will ensure that the Internet network reaches all the corners. Going wired is more expensive as the devices are bigger and pricier. For villas, it's best that the owner starts implementing the smart home solution while the house is in the construction stage. Doing so leads to better and cleaner installation. According to Dhruv Ratra, CEO and co-founder, Cubical Laboratories, the newer devices allow even villas and bungalows to be converted into smart homes wirelessly as they cover greater distances and even work around obstacles. If you are new to the smart home concept, start small and add later as you get used to the idea. "Companies like ours have modular offerings. A person can start with basic devices or with just one room. More rooms or appliances/equipment can be added later," says Ratra. Converting your house into a smart home is not entirely about convenience -- it's also about savings. You save costs when you can remotely switch off appliances that are no longer needed, or by scheduling when a device needs to be switched on and off. Companies such as Cubical Laboratories also allow you to monitor electricity consumption of each appliance/equipment. As electrical appliances get older, they tend to consume more electricity. But it's difficult for an individual to find this out. In a smart home, you can look at the historical energy consumption of each appliance and see if it has started using more power than before, and change it. When plugging your air conditioners, lights, fans, etc, into a smart device, ensure that you also have the option to operate them manually. Smart home solution providers say there have been cases where a power surge affected the sensors, and the lights either didn't switch on or switch off until the company executive came and fixed the problem. Also, before choosing a solutions provider, ask for references in your city and check out the experiences of earlier customers. Want to earn risk-free 8% annually?